The Samsung Galaxy S5 flagship smartphone has just arrived for sale after much anticipation, whereas the LG G2 released in September. 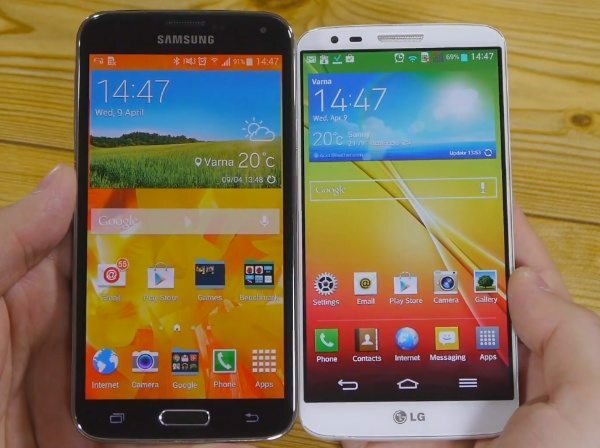 These phones both have plenty to recommend them and if you’re trying to choose between them we have a video to share of the Samsung Galaxy S5 vs. LG G2. We’ve written numerous articles now about both of these phones and if you want to read much more about them you can do so here for the Galaxy S5 or here for the G2. The 15-minute YouTube comparison that you can watch below this story comes from Phone Arena and pits both of these phones against each other with a good amount of detail. While the LG G2 may be older, it still has an enormous amount to offer and comes with a cheaper price tag too. However, you may decide that the latest device is the better of the two and opt for the Galaxy S5. The video begins with a look at the design and build of each handset followed by many other aspects such as display, software experience, processor and storage specs, camera set-up, battery life and much more. Before we wrap up it’s worth pointing out that the LG G3 is rumoured for a release in July, although this is unofficial at this stage. For now though, ultimately it’s clear to say that both have plenty going for them, but the Samsung Galaxy S5 is seen as the best device while the LG G2 still packs a punch and offers value for money. After you’ve checked out the video below we’d like to know which you will choose? One costs Â£600 and one costs Â£300, Dickhead of an article.